You have it backwards? There are two sections of backwards dialog used in this film. 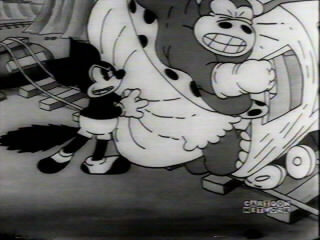 The cartoon features a lady hippo who tries to board a train but is too large. As Foxy struggles to push her on, this hippo lets out a strange squeal. There's a picture of this scene to the left. Here - listen to this squeal. But if you reverse this, it's a woman's voice saying "Susie heard one of those Atlantic bells! Whataya think" . Here - listen to the reversed copy yourself . What's Pratt On The Shelf? Behind the diving Eskimo Pie boy you can see a product called "Pratt's Dog Biscuits". This might be a reference to Hawley Pratt, who became a layout artist there several years later. However I can't be sure because I have not been able to confirm whether or not he was there at the time (he may have been working there as an uncredited staffer). 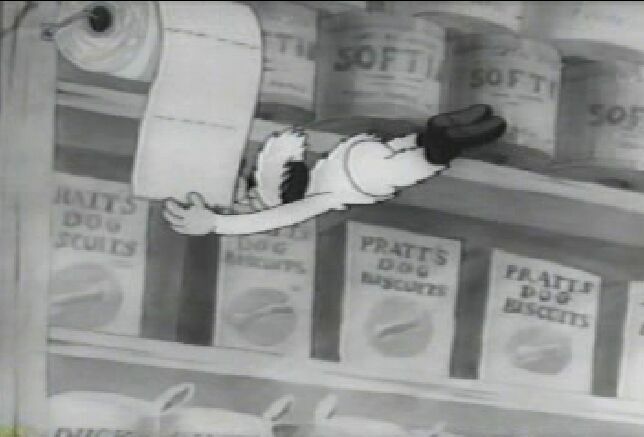 Pratt's name appears in backgrounds in other films such as I Taw A Putty Tat (Freleng, 1948), Hare Do (Freleng, 1949) and Kit For Cat (Freleng, 1948).